I love Scrivener. I don’t know how I got any writing done without it. I used to use Word to write my novels, and that was all right, but I had to write linearly and sometimes had a hard time keeping my thoughts organized. With Scrivener, 90 percent of my problems have been erased. The only thing I ever lamented was the inability to write via some kind of mobile app. Then, Scrivener released Scrivener for iOS. I teared up. Finally! Next, I discovered you could sync projects between Mac and iOS via Dropbox. I wept tears of unbridled joy. I do a fair amount of writing on the go and love the idea of not being tied to my computer. 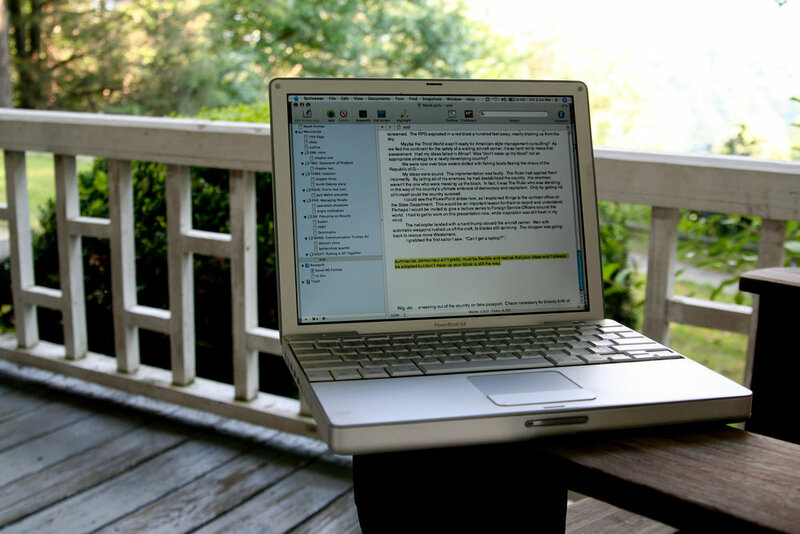 With Scrivener for iOS, I can (and am right now, in fact) write by the pool or at the beach. I can write in the car (if someone else is driving). I can even write at the dermatologist’s office. Before this app, I had to write in either the Notes app or Evernote. Once I got back to my computer, I had to transfer whatever I’d written into the Scrivener project. And I couldn’t access the whole project once I was out, which meant I could only really write one scene at a time. Annoying, to say the least. Scrivener changed all that, and I couldn’t be more thrilled. Now, everything syncs via Dropbox and I can easily pick up right where I left off. Scrivener for iOS also includes a nifty word count feature, which is great because word counts give me such life. It’s nice to be able to look up and see how close I am to meeting my daily goals. If you’re on the fence about shelling out $19.99 for the Scrivener mobile app, go ahead and take the plunge. I’m one of the cheapest people in the world, and I’m glad I made the investment. I’ve only begun using the new app and I still think it’s worth every dollar. I can’t wait to see what other cool things I can do with it.